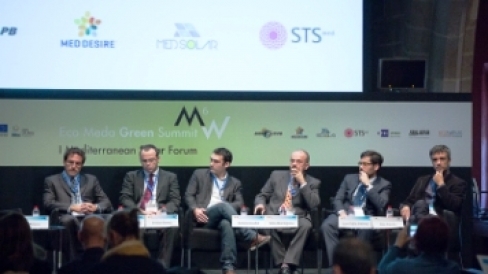 On November 27 MED-DESIRE took part to the 1st Mediterranean Solar Forum organized by ASCAME in Barcelona in the framework of the VIII edition of the Mediterranean Week of Economic Leaders. This year the Forum focused on Green Economy but also on social impact, training, policy impact and challenges in the solar sector. On behalf of MED-DESIRE project Juan Pablo Jimenez, project coordinator at IAT (Andalusian Institute of Technology), took part to the session on Regional Cooperation for the Promotion of the Solar Sector with the other ENPI CBC Med Solar Cluster projects. The debate on the state of policy and legislation, education, training and infrastructures was moderated by Luca Palazzo, JMA of ENPI CBC MED and involved also Giuseppe Desogus from FOSTEr in MED project, Cristian Bardaji from SHAAMS, Antonie Graillot from MED SOLAR, Álex Parella from DIDSOLIT-PB and Fabio Maria Montagnino from STS-MED. During the debate, four main themes were discussed related to challenges and opportunities of solar infrastructures (on-grid PV systems, off-grid PV systems, back-up PV systems); programs and necessities of education and training on solar energy; the impact and involvement of society in the implementation of solar energy and policy and legislation on the solar sector. All six solar projects have common objectives such as raising public awareness on energy efficiency through the transferability and implementation of good practices in legal, regulatory, economic and organizational issues including the promotion of new financing mechanisms to facilitate the take up of solar technologies: opportunities and potentialities of solar energy solutions, collaborative activities by public and private stakeholders, common MED long-term approach towards solar energy and encouraging informed debates. The session provided also the presentation of the features of on-grid photovoltaic systems and back-up photovoltaic systems. It was highlighted that the on-grid PV System is a technical challenge that can be boosted by simply policy, easy building integration and a high importance for the development of the industry in the Mediterranean sector. On the other hand, back-up photovoltaic systems are characterized by a more technological complexity, but they offer energy management systems, reduce fuel consumption and increase employment.